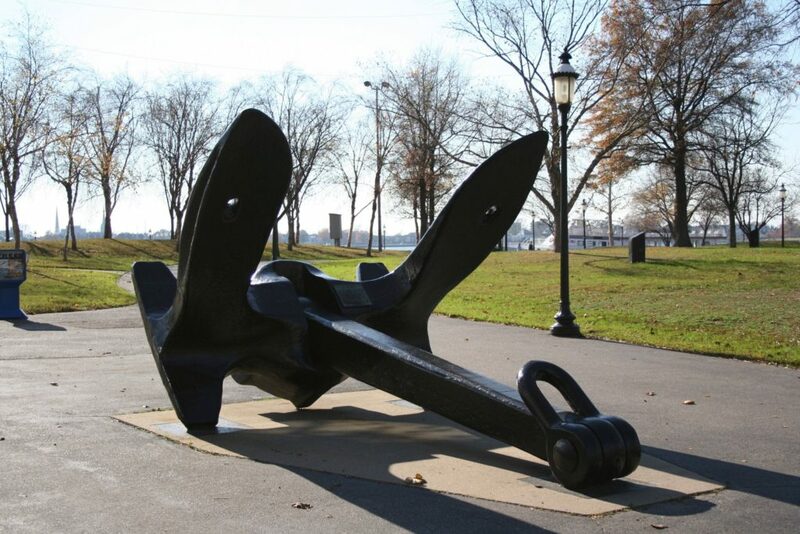 This Anchor from the U.S.S Antietam CV-63 was donated by the naval historical center U.S. Navy and dedicated to the citizens of Norfolk on October 16, 1983. This anchor was removed form the aircraft carrier U.S.S. Antietam CV-36. The Antietam was commissioned on January 28, 1945 at the Philadelphia Navy Yard. She served in the Pacific for most of her career. She earned two battle stars for service in the Korean Conflict. In 1952 the Antietam joined the Atlantic Fleet and was redesignated an attack aircraft carrier CVA-36 and was America’s first angle-deck aircraft carrier. The Antietam was decommissioned on May 8, 1963. The anchor weighs 30,000 lbs., measures 146 inches along the shank and 116 inches aross the flukes. Dedicated to the citizens of Norfolk October 16, 1983.